In general, lightning is not that dangerous, but when one faces extreme weather it might be life threatening. People who work or spend a lot of time outdoors in adverse weather conditions are particularly susceptible to lightning strikes. On the bright side, the chances of getting struck are in the range of winning the lottery. Nevertheless, it is always better to be safe than sorry, especially if one’s profession or hobby calls for potential outdoor encounters with thunderstorms. And it’s also why I’ve selected some of the best lightning detectors you can currently find on the market. To help you narrow down the choice, let’s start with what a lightning detector is and what features to look for when purchasing one. What Is a Lightning Detector? A lightning detector is a small portable device that can detect the electromagnetic pulses of lightning. Besides detecting lightning strikes, the detectors can also give a fairly accurate estimate of its distance from the lightning. Some units can even determine the relative direction and position of the lightning. There are different types of lightning detectors but for the purposes of this article, we will discuss personal lightning detectors. These devices are commonly used by outdoorsy people, sportsmen, children soccer coaches, and others. What to Consider When Buying a Lightning Detector? Even though the following list is not a full-fledged buyer’s guide, it contains some of the key features to look for. Lightning detectors usually give two kinds of directional information. This is with respect to the movement and direction of the lightning relative to your location. In other words, personal lightning detectors can tell you if the storm is moving towards, away, or parallel to you. In case you need to seek shelter, this can prove to be invaluable. The distance is usually an estimation extrapolated from the EMP signal strength. It basically tells you how far away from your location a lightning strike occurs. The accuracy may vary depending on the quality of the model. This alone makes it sensible to go for a higher-end one. Most personal lightning detectors cover a range of between 25 and 50 miles. As a rule, the models that offer better quality and more features also have a greater range. I should point out that the range is crucial lightning information since the distance is related to time. A lightning detector that offers greater range will give you more time to evacuate. This is especially important if you are responsible for a large group of people or children. 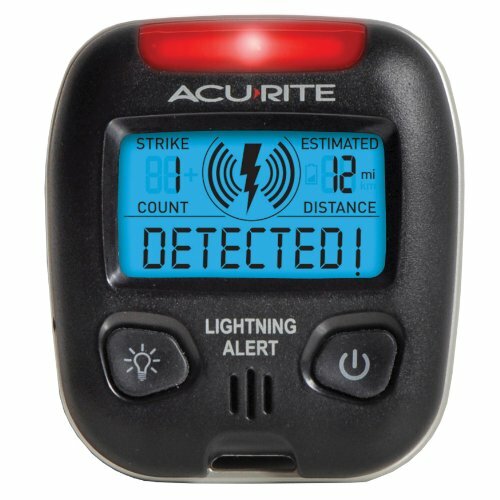 A quality lightning detector doesn’t have to break the bank as demonstrated by the AcuRite 02020. It has all of the features that a personal lightning detector should have and it comes in a durable compact case. The AcuRite 02020 has the ability to spot lightning within a 25-mile radius. Admittedly, this radius is at the lower end of the range, but it is usually enough for most outdoors men and coaches. This compact lightning detector features an audible alarm, a red warning light, text alerts, and a clear display. The strikes counter is prominently displayed including the total number of detected strikes and an estimated distance of the storm. The display is also backlit so there shouldn’t be any problem using the device in low-light settings. For extra usability, this model sports a non-slip clip for a belt or backpack. The AcuRite 02020 ​is also completely weather resistant. This lightning detector comes with improved interference rejection which protects against false alarms. And it is equally effective indoors and outdoors. The Robic Strike Alert is a pocket lightning detector with an exceptional 40-mile detection range. This rugged unit feels quite durable and well-built. In addition, the Strike Alert is also very small and sports a sturdy clip which makes attaching the unit a breeze. 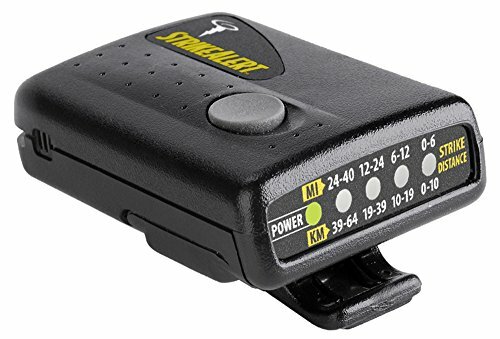 This impact-resistant lightning detector also shows if the lightning is moving away or approaching. The indicators are mounted on the side and the strike distance is displayed in miles and kilometers. An LED strobe and an audible alarm sound the warning. I particularly like that this lightning detector requires only two AAA batteries. The manufacturer estimated 100 hours of runtime between battery changes. The Strike Alert comes with a one-year limited warranty. No list of the best lightning detectors would be complete without the Xtreme Research Skyscan. This top-of-the-line model comes with premium lightning detection capabilities, 40-mile range, and a few other characteristics that put it ahead of the competition. First of all, the Skyscan uses a patented technology to estimate the distance of the detected strike. 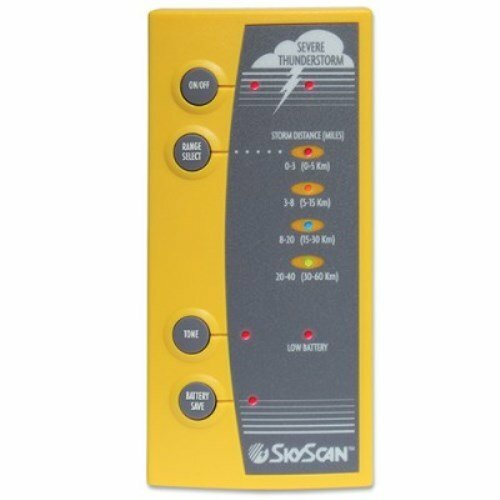 To help you keep track of an incoming storm, this lightning detector features four different range indicators (0-3 miles, 3-8 miles, 8-20 miles, and 20-40 miles). However, what’s awesome is its ability to detect certain types of particularly dangerous storms. Once the Skyscan identifies a dangerous storm lightning pattern, it triggers a Severe Thunderstorm Alarm. This gives off a special 15-second alarm that is different from the usual one. It will remain active for 15 minutes and reactivates if the impending danger persists after 15 minutes. The Skyscan lightning detector is designed to primarily work in a vertical position so the best way to go about it is to mount it on a wall. Otherwise, the device might lose some of its accuracy. A lightning detector can provide invaluable warnings about adjacent or incoming thunderstorms. The detectors featured in this article cover a wide spectrum of uses from Little League to professional outdoors men. At the end of the day, the usability and accuracy of the Xtreme Research Skyscan put it above the best lightning detectors. Let’s not forget that this model can also spot the characteristics of dangerous storms. The advanced circuitry makes it highly accurate. I can speak from personal experience. When you’re in a bind, about the only thing that’s better than having a lighting detector is to have a very accurate lightning detector.